All of a sudden, you’re more than just a couple: You’re a family. Or a bigger family. Baby’s first Christmas means starting to see this wonder-full season through a little one’s eyes. 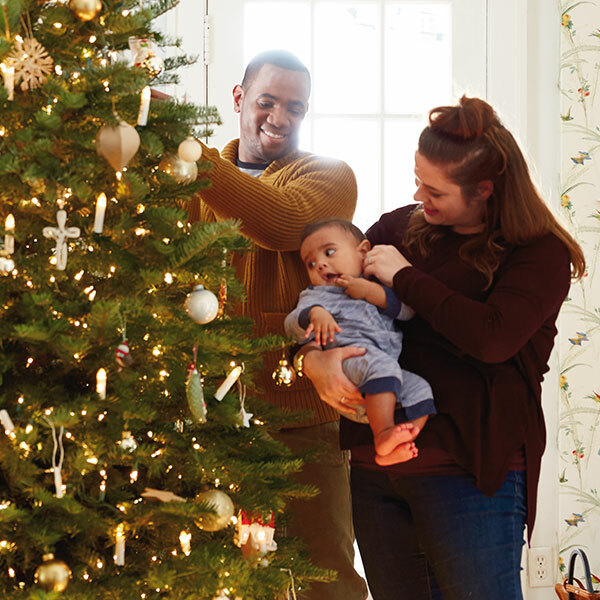 Whether you go all in or keep it simple, you’ll start to discover which of your favorite family Christmas traditions you’ll teach your children and what memories you’ll make for yourselves. Adding a baby to the mix means accepting the unexpected. And cherishing those perfectly imperfect moments that come when you’re a mix of excited and sleep-deprived, the baby is being a baby, and everything is a first. You’ve got some cute new holiday swag in your future. Christmas cards. Nothing says, “EVERYTHING IS DIFFERENT THIS YEAR” like another name and face on your Christmas card. Stockings. It’s time to hang another stocking by the chimney. Will yours all match, or coordinate? Will you embroider names, have them monogrammed, or label them with glue and glitter? Snuggle-wear. Bundle up in matching PJs, slippers, and robes—in sets of three. Got pets? Don’t leave them out. This is your time to set the bar for adorable or ridiculous for years to come. They don’t have opinions (yet), but there will be someone new to appreciate your Christmas centerpiece. Live trees. Bundle up and pick out an evergreen from a cut-your-own farm, a local organization’s tree sale, or an area store. Artificial trees. Or release your vintage tree from the attic in all its sparkly silver foil splendor. Tiny trees. Get a baby tree (real or artificial) for Baby’s room. Soft Christmas lights are lovely when you’re rocking a little one to sleep. Decorating your tree just got 100% more meaningful. Baby’s First Christmas. These ornaments are the cutest little things you can put on your tree. Find them personalized with the year, or with Baby’s name or a photo or a footprint…made to match your favorite Disney character…or just simple, classic baby icons. Children’s age ornaments. Count up the memories year by year. They come in matched sets, or you can just find the right age every Christmas. Make your own. DIY some ornaments for your tree and as family gifts. Keepsake Ornaments. Get characters from favorite bedtime stories or the movies you streamed when you were up all night. Memorabilia. Pick up ornaments when you travel or go to events as a family. 3D scrapbook. Every year, choose an ornament or two—you can do it with your children, as they grow older—that captures what was special about that year. When you hang them, tell the stories behind each one. And years from now, when your little one is all grown up, you can box those ornaments up for their first Christmas tree. You know who loves babies? Grandparents. Travel plans. So, will your loved ones drop by for a visit and a cuddle? Or will you bundle up and make the rounds to see them? Homebodies. Hint: There’s no better excuse to move Christmas to your house than a new baby. If you’ve been hoping to make your home the place…this is your moment. Over the river… Sometimes, of course, the most meaningful memories are made in other people’s homes. The holidays are when you learn that grandparents make the best babysitters and cousins make the best friends. Family traditions. The calendar fills up fast with family gatherings. Will you go to a candlelight service or midnight Mass with your parents? Say Hanukkah blessings with in-laws? Curl up on the sofa for college bowl games? You might find yourself with new “must-dos” this year. Meet the big guy. Let’s start with the visit to Santa and the resulting angelic or red-faced-screaming snapshot. Sweet stuff. There’s cookie making—even if Baby’s whole job is to gleefully gum a sugar cookie until face and hands are covered in sprinkles. Put a bow on it. Your small roommate might “help” with the gift wrapping—in which case we strongly suggest taking some super-silly pics. Snow day. Is it snowy outside? Take a picture of your well-bundled baby (what you can see of them, anyway). Love out loud. Reading and singing your favorite Christmas stories and songs are the absolute best. Of course, the big day may start earlier or later than usual this year. Go time. Does your family unwrap gifts on Christmas Eve or morning? Maybe there’s a special night-before gift of adorable pajamas and a book. Treats for everyone. Some families leave “reindeer food” (Cheerios™ and glitter) or celery and carrots for Santa’s sleigh-pullers along with cookies for Mr. Claus. And the letter to Santa should always include all the ways yours is a very good baby. Favorite stories. Will you snuggle in bed and recite “A Visit From St. Nicholas” before going to sleep? Or read the Christmas story from a family Bible before you open gifts? Christmas cards. Baby can’t read yet…but you can pick out a Christmas card and write stories from the year, hopes for the future, and messages of love, then keep it in a memory box. Reading these holiday wishes every year is a sweet way to count your blessings. Of course, this first year, all the memory making is mostly for the parents. But even though babies don’t understand why you’re doing what you do, every now and then you’ll catch a look of wonder at the sparkling lights. Or get a toothless grin or giggle when you put on silly antlers. Or feel the warm weight of a baby in a Santa onesie sleeping on your chest. And you’ll know this Christmas is the best one yet—and they’ll just keep getting better.